LAKE FOREST, CA--(Marketwired - Feb 2, 2017) - Del Taco Restaurants, Inc. (NASDAQ: TACO) is thrilled to bring back its popular crispy shrimp in a big way, with the introduction of new Jumbo Shrimp, available for a limited time. Now with even bigger shrimp in every bite, the new premium seafood offering is featured in the Jumbo Shrimp Taco, the Jumbo Shrimp Burrito, and the Epic Surf & Turf Burrito. Jumbo in both size and flavor, there is nothing small about these shrimp! "Our fans look forward to the return of our famous crispy shrimp, and this year we set out to give them even more of what they crave with our new, bigger, better Jumbo Shrimp," said Noah Chillingworth, Vice President of Marketing, Del Taco. "Only Del Taco can freshly prepare quality seafood tacos and burritos and serve them at the speed of our drive-thru. With the Lent season beginning March 1st, we're giving our guests even more delicious options at the value for which Del Taco is known." 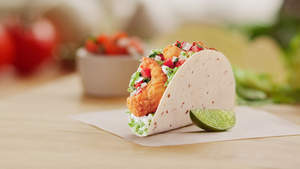 Seafood lovers can also enjoy Del Taco's year-round guest favorite, Beer Battered Fish Tacos, made with hand-cut sustainable wild-caught Alaska Pollock in a crispy beer batter. Each fish taco is topped with crunchy shredded cabbage, Del Taco's secret sauce and handmade pico de gallo wrapped in two warm corn tortillas and served with a fresh-cut lime wedge, available a la carte or as the entrée portion of the new Platos meals served with beans and rice plus chips and salsa.